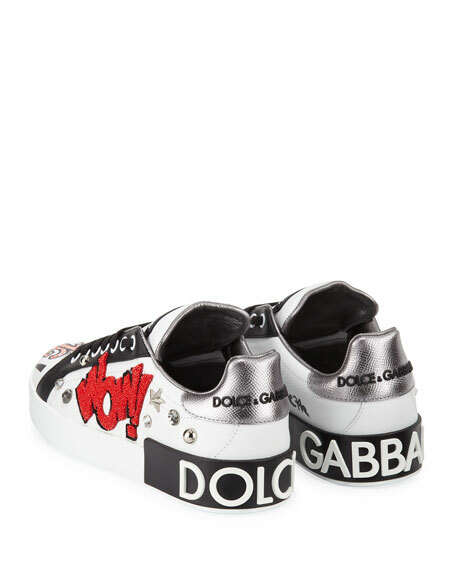 Dolce & Gabbana leather sneaker with cartoon graffiti design, embellished with studs, rhinestones, and beaded "Wow!". Flat platform with raised "Dolce & Gabbana" lettering. Round toe with spiked trim. Dolce & Gabbana napa leather sneaker with heart embellished trim and appliqués. High platform with spike studs and metal logo heel counter. Round printed toe. Logo-embossed lace-up vamp. Sequined "Amore" text at side. Sequined heart at tongue. Logo metallic backstay. Leather lining. Rubber outsole. Made in Italy.